I recently played one of the most fun sessions of Dungeons and Dragons in my tabletop gaming history. It was with adult coworkers aged 25 – 35 who were almost entirely new to the game. After me the player with the most amount of tabletop role-playing game experience had last picked up dice and a character sheet when he was 14. It was everyone else’s first time. I was a tad nervous running a new game for adults because I was worried they’d find D&D too childish or nerdy or worse… boring. I have certainly had a fair share of new players at my table, but I’ve never a whole table full of newbies. My usual tactic of letting the other players shepherd the new one along doesn’t work when everyone is getting their first taste of fifth edition D&D nectar. Still these friends had come to me because they wanted to learn how to play. I know it can only help the hobby if I spread the good word, but only if they had a blast. If they don’t have a good time with the game, I’ve just turned off six potential tabletop gamers. I’ve already told you I had a great time and so did the players. We began talking about our next session before the first was even done. What did I do that made the game so successful? Here’s a few things I did and tips from me if you’ve got the chance to introduce new players to the game. Behold! That’s me and some eager new players. I know part of the fun of D&D is getting to make a character, but that process can be intimidating for new players. Calculating AC, hit points, attack bonuses, and ability scores is only fun if you understand what those things mean. Yes, there are a lot of fun story choices made during character creation (like class, race, and background), but a lot of those same choices are made when your players pick a pregenerated character. It’s a little more limited since you pick all three at once, but that won’t make a huge difference to totally new players. If they’re anything like the group I played with, they don’t really understand the differences between a halfling rogue with the criminal background and a drow rogue with the sailor background yet. A lot of the fun details, like character names and the specifics of personalities, are still up to the players when they choose a pregen. When you use pregens your players aren’t bogged down in the rules and you’re sure everything they need is on the sheet in front of them. They won’t leave something off by accident and have every ability spelled out so they don’t need to keep flipping through the one copy of the Player’s Handbook you own. It also means you can get into actually playing a lot more quickly. You can find a bunch of ready-to-go pregens on the D&D website. I know. 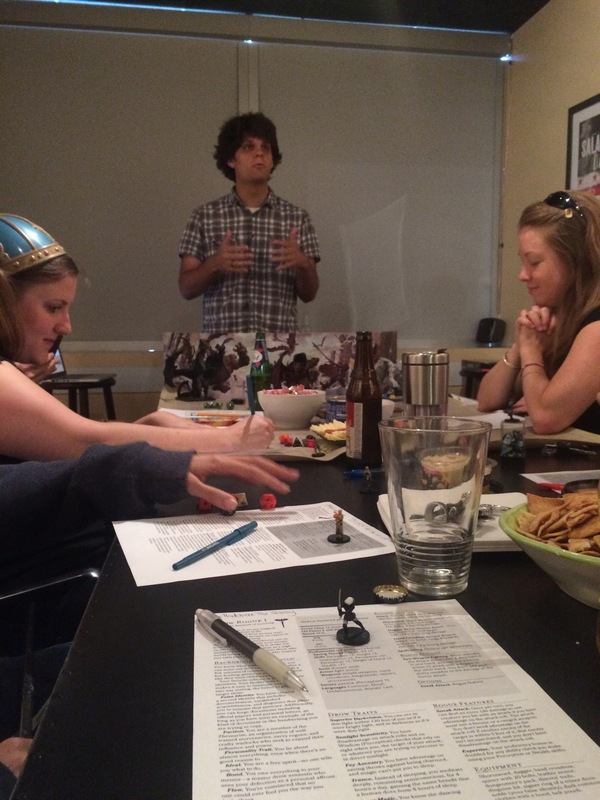 Characters are squishy at level 1 in fifth edition D&D. If that bothers your players, don’t be afraid to fudge the numbers or nerf some damage in order to keep them alive… or don’t be afraid to show them that PCs can die if you think they can handle it. If you’re using pregens, they can always just grab a new one and don’t feel invested since they didn’t spend an hour making a fighter. This may not be as big of an issue as it seems. I fudged nothing and all PCs lived through the adventure. Starting at level 1 means you’re starting with very simple characters and that’s good. Even fifth edition D&D has more rules than most people who have only ever played mainstream board games are used to. The spellcasters only have a few spells to track, the warriors don’t have a bunch of abilities and feats, and the tricksters only have a couple of tricks. The concept of tracking hit points, hit dice, spells, abilities, bonuses, saves, attacks, inspiration, movement, reactions, actions, and bonus actions is already more than most new players can handle. You don’t need to complicate by starting them at a higher level and giving them more options. If you have it, use the D&D Starter Set. It’s only $20, cheaper on Amazon, and even if you’re an experienced dungeon master, this adventure was crafted for beginner players. It introduces them to simple concepts in combat, interaction, and exploration which get gradually more complicated and sophisticated as the adventure goes on. If you’ve got the time and the desire, go ahead and write your own, but why do something that’s already been done for you? In addition it’s got a quickstart rulebook you can give the players since they’ll probably come without so much as a pencil because it’s their first time. As a bonus the adventure inside is one of the best ever published for fifth edition in my opinion. Before you start playing, it can be difficult to know what to tell the players and what to teach them along the way. You don’t want to have two hours of explaining rules before someone gets to talk about their character, but you also don’t want players going in blind. Here’s what I explained. The first thing I did was explain which die corresponded to which symbols on their character sheets. Most of them had only ever seen a six-sided die before so it helped them make sense of everything in front of them when I told them what a d4 was and what a d20 was. Then I told them to look on their sheets to see if they could find the dice they’d be using most often. After explaining the dice, I went around the table and gave each character an idea of what their strengths and weaknesses were. I kept it simple and didn’t get into the mechanics. I’d say, “As a wizard you can cast spells with flashy effects like rays of fire and mind-bending enchantments, but you should stay away from hand-to-hand combat” or, “As a ranger, you’re good at fighting from a distance with a bow and arrow, an excellent tracker, and a friend to animals and plants.” This gave the players a basic idea of what their options were and what they might ask to do at the table. Attributes, the backbone of D&D, had to be explained. I did it simply. “The higher the number you have in these, the better you are at tasks associated with that attribute. 16 or 17 is the highest any of you can see right now, which is exceptional. 10 is average.” Then I explained what each attribute meant, which was more or less self-explanatory, though I did have to breakdown the difference between Intelligence and Wisdom. After that I explained that modifiers were applied to dice rolls and that in some cases they might get an extra boost if to that roll if the task they were trying to accomplish was associated with a skill they were proficient in. Then I gave them an example of how checks work by asking the rogue to roll a Dexterity (Stealth) check and having the cleric make a Wisdom (Perception) check to try to find him. Then get to playing. Odds are you’ve already spent a half-hour, like I did, explaining all of this to your players. Trust me, you’ll cover it all as it comes up. More on that later. Now that you’ve talked for a while, let the players introduce their PCs to get them involved in the game. I had my players announce their character’s name, class, race, and give one interesting fact about their PC that could be anything they wanted to say. They had a blast doing this and it helped give them the idea that their characters could say and do anything they wanted them to. I made sure I spoke loud enough for the whole group to hear whenever I did this. Sure, the paladin is the only person making an attack right now, but if I explain the basics to him, then the ranger already knows some of the basics on his turn. For attacks I said, “Ok, so you have +5 to hit with your longsword. Roll a d20 and add five to the result. See how you have an Armor Class? Well so does the goblin you’re attacking and you need to match or get a number greater than his Armor Class to hit him. Then you’ll roll for damage which takes away from his hit points. He’s trying to do the same thing when he attacks you.” By taking the time to explain (and re-explain) concepts like this as they were happening, it helped the players remember in the future what they needed to do. As I was explaining I told my new players monster hit points, armor class, skill difficulty checks, and save DCs. I told them they wouldn’t always know these numbers, but for the purposes of learning I gave them a peek behind the screen. It really drives home that an attack roll is compared to AC when they know what number they’re trying to beat. The importance of hit points is made clear when a goblin dies after taking 6 damage. By the end of the night they understood a DC 10 save was pretty easy and a DC 15 was something to hold their breaths over. To encourage my players to get in the spirit of D&D and bring them out of their shells I gave plenty of descriptions and used over-the-top voices so they’d feel ok doing the same. I then encouraged them to also give me descriptions of killing blows, skill checks, and anything else I could think of. I liberally awarded inspiration for even pretty good descriptions so that they’d have more of a reason to immerse themselves in the game and their characters. They loved it! All that extra inspiration helped those 1st level PCs survive. Like I said, everyone had a good time and we’re set to play again soon. Things went so well another 8 people in the office want to play as well… Any good DMs out there willing to take on some n00bs? That’s awesome! It mirrors a lot of what I saw through teaching my kids. I forget that adults can learn too, and that a lot of the same guidelines apply. I was just reading your account of that! https://elvenwizardking.wordpress.com/2015/08/11/5th-edition-and-my-kids-in-which-we-all-learn-something-new/ It’s great! Here is a great article on introducing new players, aimed at the GM rather than the new player, but it is worth checking out by everyone. If you do something, let me know how it goes, Ix. Those are some lucky players! That’s good stuff! Had it been awhile since you roleplayed as well, or have you been gaming regularly ever since you were young? I’ve been gaming regularly since I was 9. Interesting character sheets. Do you use that only for new people or for everyone you play with? Are those generated or do you copy and paste/type that up on your own? Those are the ones on the Wizard’s site. I use them for new people and sometimes for con games when I need a PC in a pinch. I see. I think I have been to that page before, but never have I seen those pregens. Cool. Thanks! I like the layout of those sheets. I need to find a template for that style. Yeah I don’t know where Wizards is hiding that!